It's hard to believe it's been 10 years since Capitol Place was built in Downtown Honolulu. Capitol Place was completed in 2008 and developed by the MacNaughton and Kobayashi Groups - both visionaries and brought a lot of the successes from Hokua, which they just wrapped up 2 years prior. The project was also a joint venture with the late auto dealer Jimmy Plueger who had owned the land. It was the first of its kind with a retail car dealership on the ground level and fee simple condos above. Since then, Oliver McMillan teamed up with JN Extotics to develop a similar concept - Symphony Honolulu in Kakaako (completed in 2016). 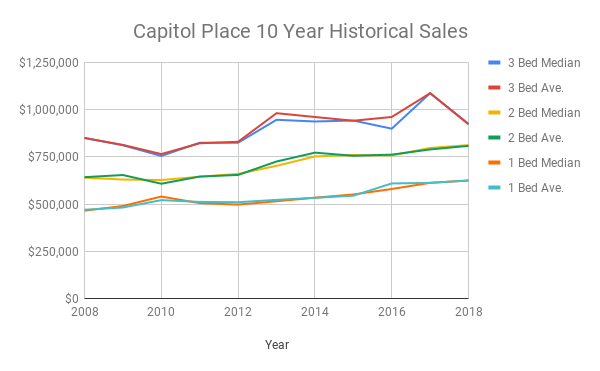 The graph above shows both the median and average sales price of 1, 2 and 3 bedroom condo sales from 2008 through 2018 (YTD). What's apparently clear (like most Oahu real estate since) is 2009-2012 were definitely the years to buy in hindsight. Also, like most Oahu real estate the prices are quite a bit higher than they were at the previous peak. We're fortunate in that there's still many markets across the US where prices have not rebounded since their all time highs. So, it appears the 1 bed units appreciated the most over time. Both the 1 and 2 bed units appreciated over 3 times more than the 3 bed units! Hindsight is always 20/20, however perhaps a takeaway is to buy something that's more affordable? Another major change outside of the condos themselves is Phlueger Honda rebranded as Pacific Honda after some of the negative press received of the late Jimmy Phlueger. Although he did a lot of good for the community on Oahu, the constant news coverage of the Koloko Dam Breach on Kauai probably made it a good idea to move forward with less distractions from their core business. There's not much competition if you want a quality product in Downtown Honolulu. Most all the new construction is taking place in Kakaako and if you want the ability to walk to work, live in a building with outstanding service, pet friendly environment and one of the nicer condo gyms in town, Capitol Place could be the right place for you. If you're thinking about buying or selling at Capitol Place, feel free to contact me for more information.